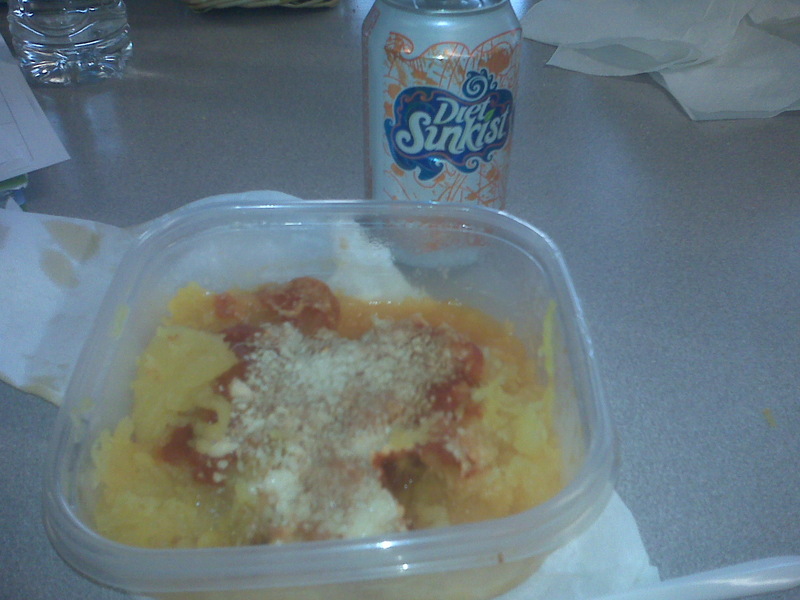 After hearing raaave reviews from sisters Lisa (pamperedwithpaige.com) and Lindsay (goodiesgalore.wordpress.com), I hesitantly finally decided to try spaghetti squash…LOVE IT! I am offically addicted. UNfortch, the husband is NOT. Whatevs, more for me! lunch leftovers (from yesterday)! Anyway, I do NOT know what is wrong with me! I haven’t been feeling exactly right lately, which there are some things that I know are contributing to this, but today I woke up at 2 PM! Yes, people you heard me- 2 PM! What the heck!??! And the worst thing? I AM STILL TIRED! Boooo! What is wrong with me? I even went to bed at maybe 11 last night? oy! Last night Ian and I went to the opening party of my friend’s yoga studio. It is really cool that she is fulfilling this dream of hers and I am proud. Review post to follow, but I am currently watching re-runs of Say Yes to the Dress. What is it about that show that gets me? Anyway, talk to you in a bit!